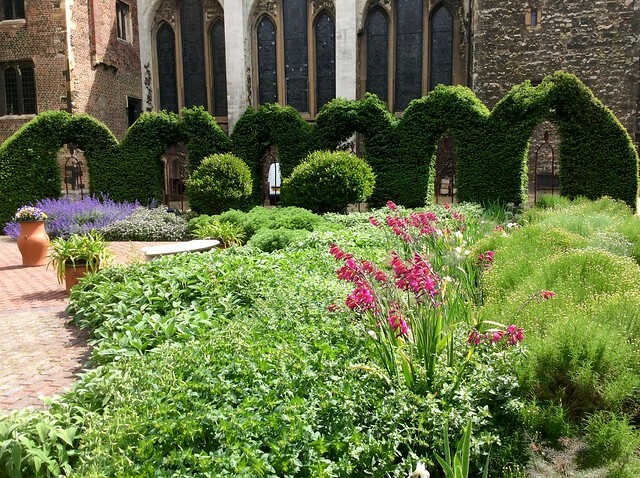 In the past it hasn’t been easy to visit the garden of Lambeth Palace, the oldest continuously cultivated garden in London (it’s been there for eight hundred years). The only way was by booking one of the none-too-frequent guided tours. But from March this year things have changed. Now you can wander around at your leisure, as Yannick and I did last week. 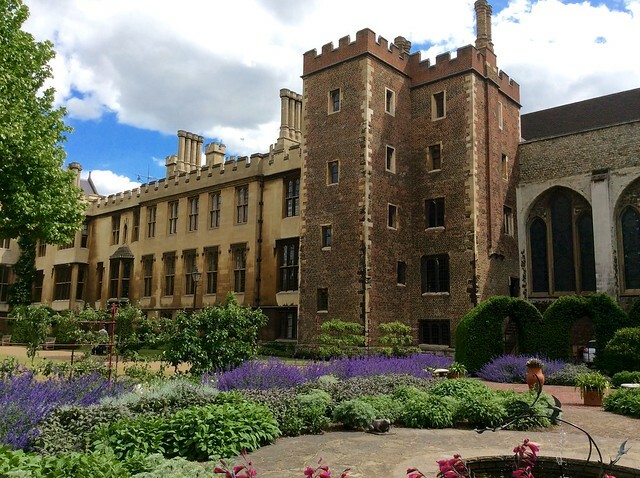 Lambeth Palace has been home to the Archbishops of Canterbury since the fourteenth century, and the decision to open the gardens more frequently was taken by the current Archbishop, Justin Welby, as part of a strategy to make the Palace more accessible to the public. Not that you can just wander in and out as you like; the garden is only open on the first Wednesday of the month, so you’ll still need to plan ahead, but you don’t have to book, and you don’t have to join a tour. There are volunteers on hand to tell you where to go when you first arrive. 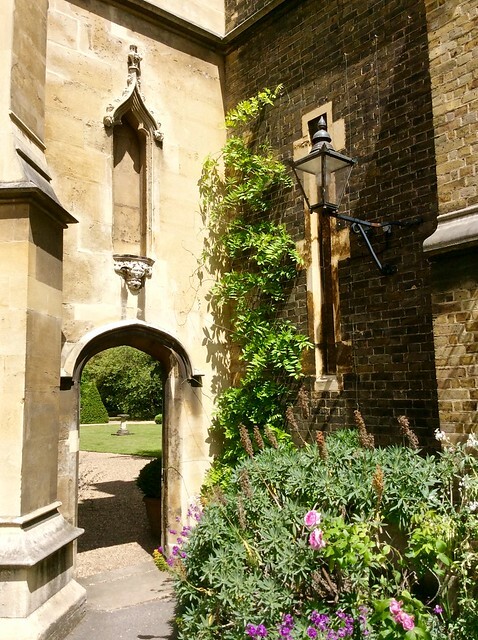 Just as well – access to the garden is through a little door in the corner of the courtyard in front of the Palace that you could easily overlook. It’s bigger on the inside – nearly eleven acres, maintained by three full time gardeners plus volunteers, using organic principles wherever possible. 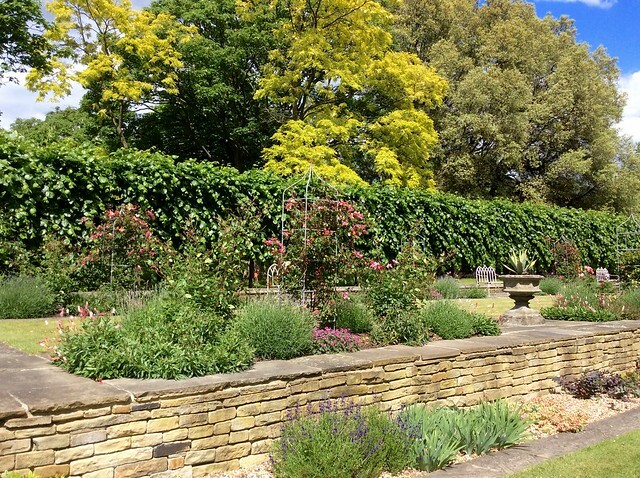 Close to the house is a formal lawn and a raised stone terrace planted with tea roses and lavender. The little free guide tells you a lot about the garden and its flowers. 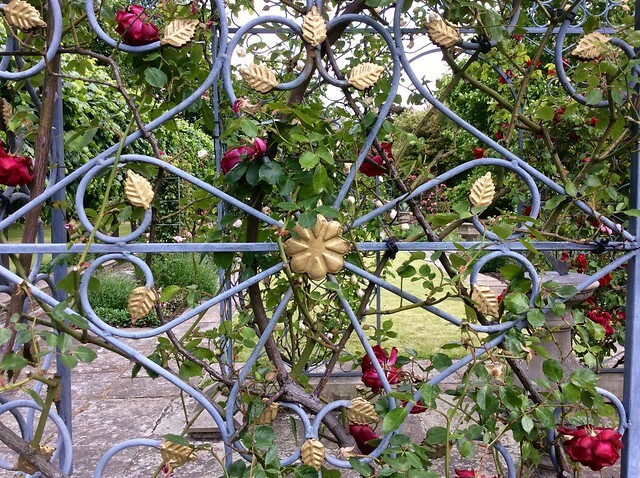 This lovely tea rose is Ellen Willmott. 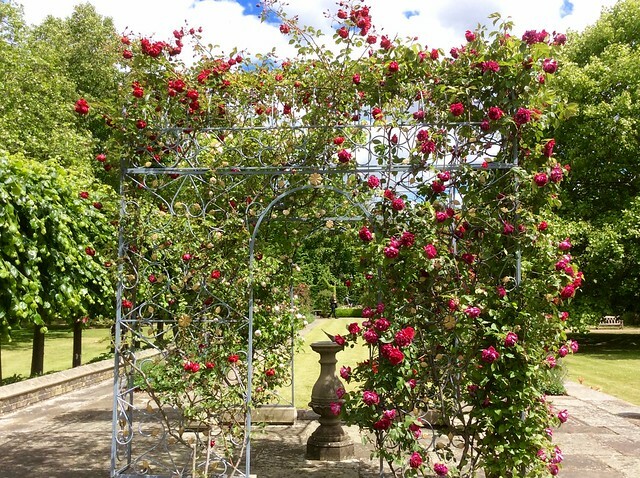 The rose arbour supports four different climbing roses and a clematis, and has a sundial at its centre. 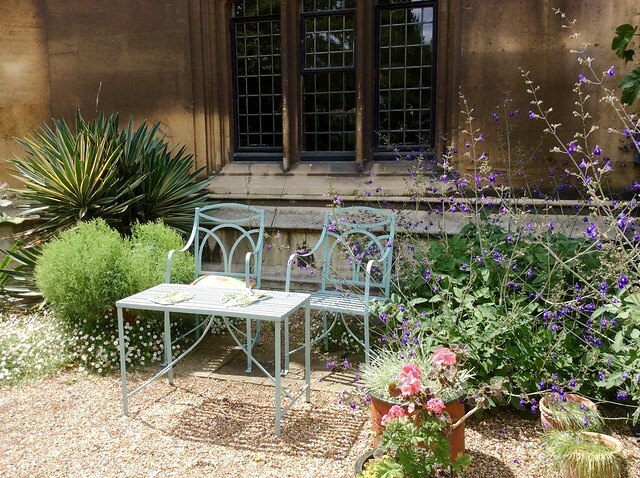 The Chapel garden is planted with plants with purple, silver and green scented leaves, interspersed with Iris Florentina. 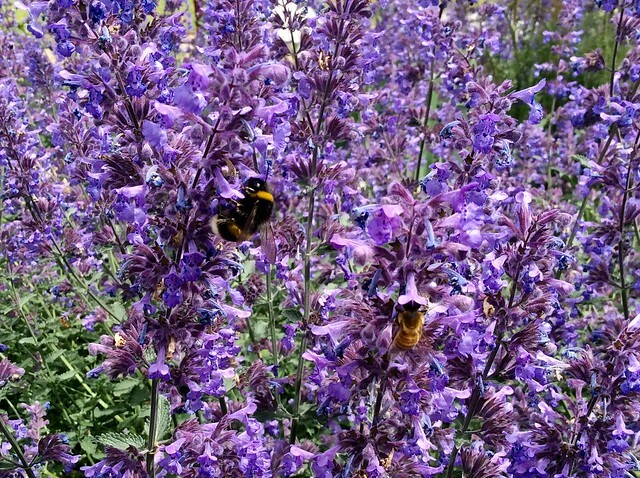 I thought these banks of purple flowers were lavender at first, but in fact they’re salvia, massively popular with the Palace’s bees which were hard at work when we were there. 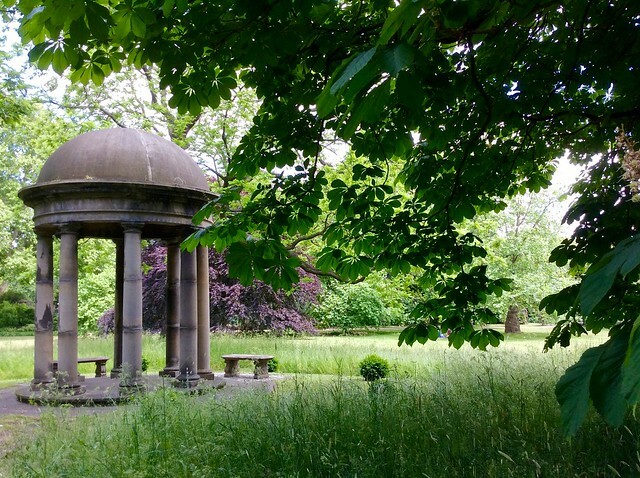 Beyond the formal garden is a much larger parkland style garden with a rotunda and some beehives tucked discreetly away behind a little pond. 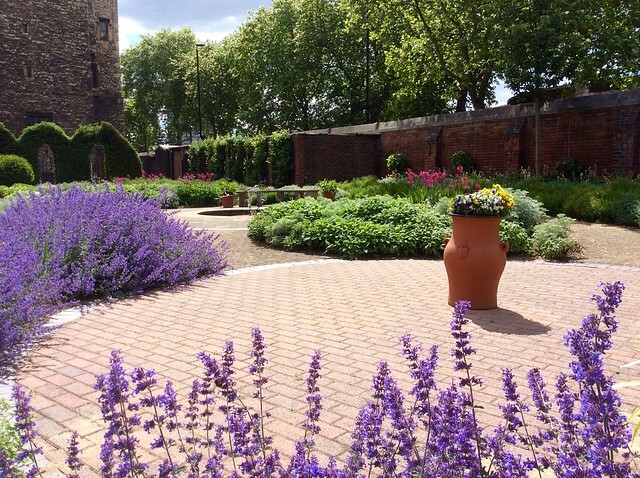 The garden was a peaceful oasis in the heart of London. It was hard to believe we were just across the river from the Houses of Parliament. 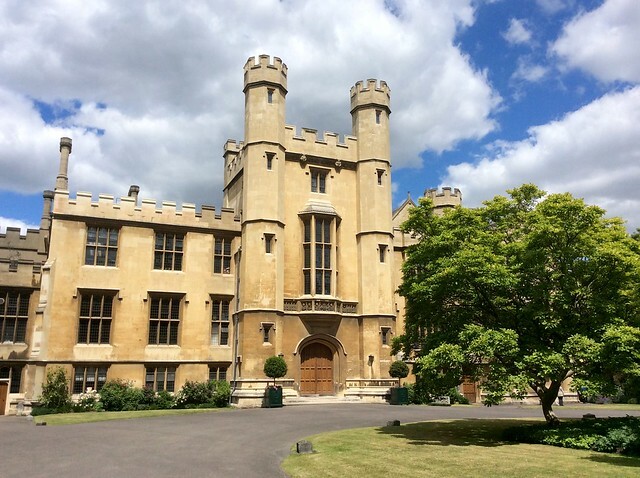 Lambeth Palace is on the south side of the Thames, just across Lambeth Bridge. 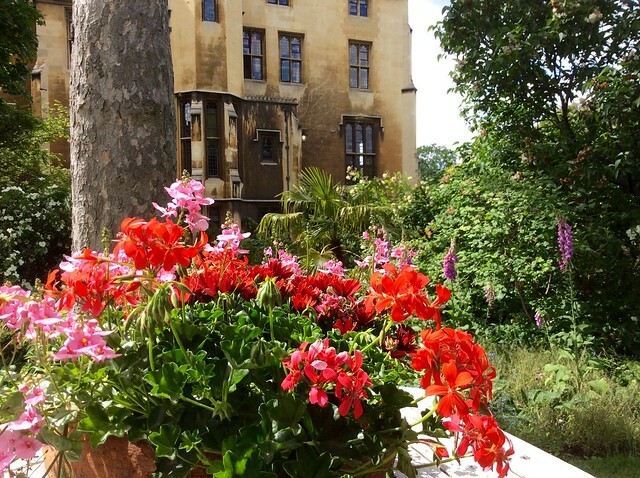 It’s open between 12 pm and 3 pm on the first Wednesday of the month, with no need to book in advance. According to the website, entrance is £4 – we paid £5 but as it’s for charity it hardly matters. They don’t have a café but they do serve tea and coffee and they don’t mind if you take your own picnic. If you want to see inside the Palace instead, they have guided tours on Thursdays and Fridays. 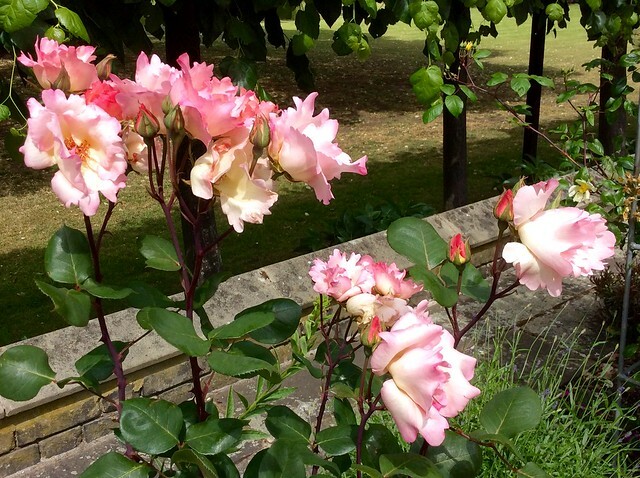 This entry was posted in Flowers and plants and tagged Archbishop of Canterbury, flowers, gardens, Justin Welby, Lambeth Palace, London, nature, plants, Roses by Fran. Bookmark the permalink. I knew our urban bee keeping expert would be pleased! 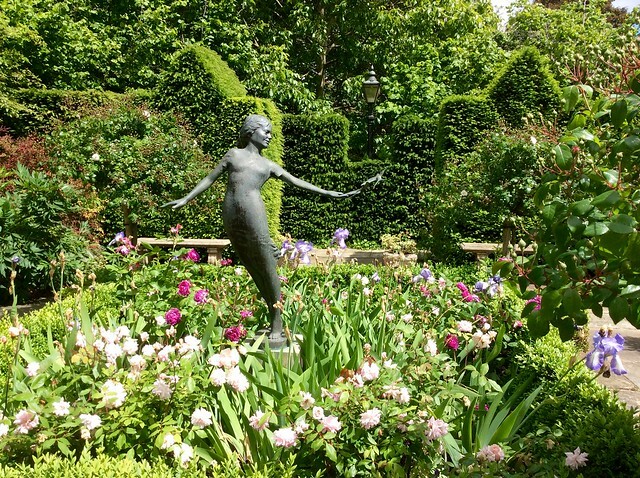 What a beautiful garden, definitely worth paying a visit. How lucky I have got Wednesdays off! Fingers crossed for good weather on the first of July then! 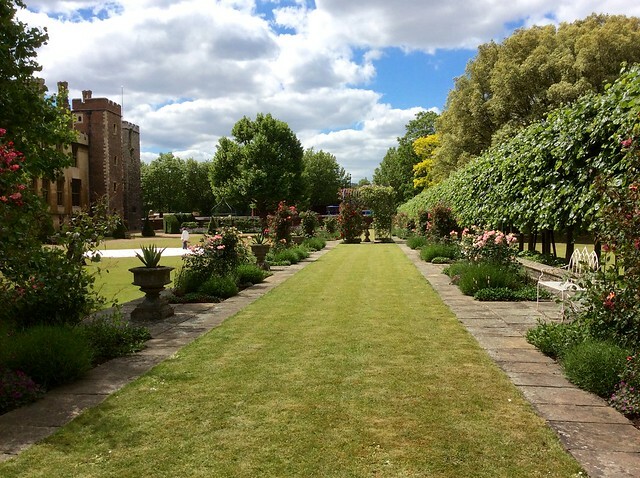 Wow those formal gardens have given me some garden envy! 11 acres! In central London that’s amazing. It looks beautiful. Will add to my lust if things to do in London! Lucky you – it is lovely.